This is my requiem for the Brown Eyed Handsome Man. On March 18th, 2017, we lost another titan. There are only a few people in the music biz that forever changed the landscape. Sure, there are many giants in rock and roll, but there are only a handful of legends, singular people who were so influential and cutting edge that we literally owe everything to them. Chuck Berry is one of those icons. When he burst onto the scene in 1955 with "Maybelline," nothing would ever be the same again. This is not hero worship or hyperbole; this is fact. His unique two-string method of riffing mixed with his chugging, bluesy style of rhythm guitar was new and revolutionary in the early days of the electric guitar. And he didn't just have the guitar chops, he had the swagger to back it up. With his guitar slung lower than most people played and his legs spread wide, he cut a figure that was sure to be remembered. Factor in his signature duck walk and you've got a legend. Unlike a lot of performers at the time (or to this day), Chuck wrote most of his own songs, including one of music's all-time greatest rockers, "Johnny B. Goode." 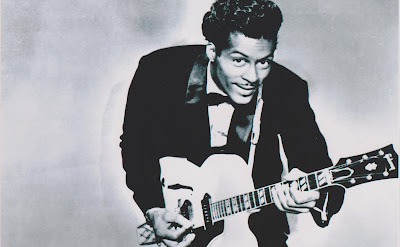 That song from Chess Records, like so many other Chuck Berry tunes, was penned by Berry, played by Berry, and taken to the top of the charts by Berry. Rock music is the child of the black man's blues, and Chuck was one of the first black men, along with Bo Diddley, to transform those blues into rock and roll, presenting them to a wide, largely white audience in a time when the music business had a pretty low ceiling for people of color. He was a pioneer, a rebel and a heck of a performer. A young Elvis Presley was influenced by Chuck Berry. So were each one of the The Beatles. The Beach Boys loved Berry so much that they rewrote some of his songs as their own, and gladly shared co-writing royalties with him. Keith Richards thinks of Chuck Berry as a god. Chuck is one of the founders of rock and roll, and the last sixty years of music would look and sound very different if not for the self-proclaimed Brown Eyed Handsome Man. It's hard to mourn a life that lasted 90 years because he accomplished so much and tore down so many barriers. He was famously working on a new album that was expected to be released later in 2017, and I hope we still get that album, even if it's unfinished, so that we can hear what rock sounds like at 90. I have lots of favorite Chuck Berry tunes, from his definitive version of "Route 66" to "School Day (Ring! Ring! Goes the Bell"), but I think perhaps no song would be more fitting to say goodbye to Chuck than his 1960 hit "Bye Bye Johnny," his semi-sequel to "Johnny B. Goode." Bye Bye, Johnny B. Goode. So long, Chuck. Till we meet again.